Our lives are elevated when they're sympathetic to poetry's wavelengths. We're grateful to find this can happen. In A.E. Stringer's poems this happens as though it were second nature. The poems in Human Costume explore the multiple figures we become. If spirit inhabits form, then our human selves wear flesh and feeling like costumes that both veil and reveal what animates us. 'Is this a laugh on real / life or a mask we cannot take off, put down?' the speaker asks in 'Low Opera,' considering life's imitation of art. At the heart of the book lies the calendar's juxtaposition of All Hallows Eve and All Saints Day, which celebrates the soul's extremes. From the unearthly delights of being alive in the cosmos, through the sufferings of armed conflict and the further trial-and-error of work and love, to the artful (and artfully misrepresentative) forms our human desires take, this book takes a wide angle on the great pageant. A. E. Stringer is the author of a previous collection of poems, Channel Markers (Wesleyan University Press). His work has appeared in such journals as The Nation, Antaeus, The Ohio Review, Denver Quarterly, Shenandoah, Poetry Northwest, and The Cincinnati Review, as well as in the recent anthology, Backcountry: Contemporary Writing in West Virginia. He has recently edited and introduced a new edition of Louise McNeillâ€™s classic Appalachian poetry collection Paradox Hill (West Virginia University Press, 2009). He has travelled to read his work in a wide range of American locales and also in Galway, Ireland. For the past twenty years, he has taught writing and literature at Marshall University in Huntington, West Virginia. American poet A.E. Stringer teaches writing and literature at Marshall University in Huntington, West Virginia, from where another Salmon poet, Ron Houchin, hails. Houchin has an Appalachian connection and so too does Stringer as he edited a new edition of Louise McNeill's collection of Appalacian poetry, Paradox Hill. This is his second collection of his own poems after Channel Markers, published by the Wesleyan University Press. His work has appeared in American literature journals and he has travelled across the United States and even to Galway to read his poems. This current collection explores notions of identity and being. 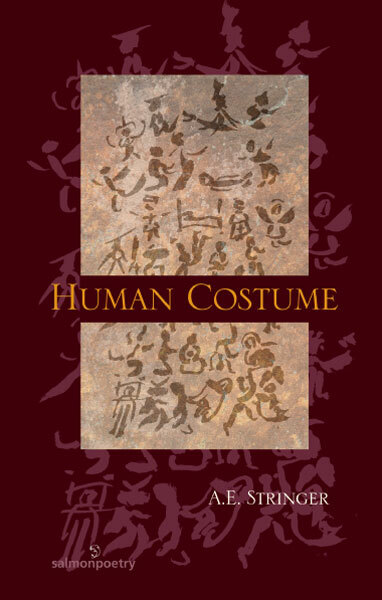 The human costume of the title is not just the flesh that our spirits wear but the facial expressions and gestures we adopt. The poems also play with the idea of the extremes of human existence. Starting with the apparent paradox of Halloween being followed by All Saints Day, that is the sinners and saints together, he considers the coming together of other extremes in human experience like earthly delights and physical suffering, or love and war. A constant theme running through this collection is what Stringer calls 'the emptiness' of extremes' in the poem 'Headstone Circus'. The poems in Art Stringer’s latest collection center on the concept that human beings become multiple figures, and can change themselves as if they are swapping one costume for another – a process that can “both veil and reveal what animates us.” The title poem focuses on extreme situations: at the stroke of midnight, All Hallows Eve becomes All Saints Day, and when the speaker shows up at a Halloween party, he sees someone who is wearing his shoes, cap, gloves and even his manner: his double, a charmer, has the audacity to make an unsuccessful pass at the speaker’s wife. But instead of being angry, the speaker is rather proud: “He’s a brilliant study, like you-know-who. / That’s the beauty part.” But at the witching hour he slips away, and the speaker is waiting for him: they exchange clothes, and the double “dwindles into the harvest moon.” The speaker returns to the party, kissing a “fallen angel” en route -- after all, it’s a holy day. affection, and hooked mine, I had to look away. “Call me,” you said when I left. I said I would. What I did was lie for months, ears ringing. for thrills impossible to overestimate. Philip St. Clair is Professor Emeritus at Ashland Community and Technical College in Ashland, Kentucky. His most recent poetry collection is Divided House, published by Finishing Line Press in 2005.